When an application can determine how much work needs to take place (e.g. read a fixed number of bytes from a file) and can monitor its progress, it can use the Gtk.ProgressBar in percentage mode and the user sees a growing bar indicating the percentage of the work that has been completed. In this mode, the application is required to call Gtk.ProgressBar.set_fraction() periodically to update the progress bar, passing a float between 0 and 1 to provide the new percentage value. When an application has no accurate way of knowing the amount of work to do, it can use activity mode, which shows activity by a block moving back and forth within the progress area. In this mode, the application is required to call Gtk.ProgressBar.pulse() periodically to update the progress bar. You can also choose the step size, with the Gtk.ProgressBar.set_pulse_step() method. By default, Gtk.ProgressBar is horizontal and left-to-right, but you can change it to a vertical progress bar by using the Gtk.ProgressBar.set_orientation() method. 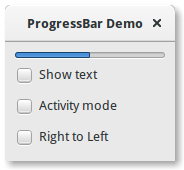 Changing the direction the progress bar grows can be done using Gtk.ProgressBar.set_inverted(). Gtk.ProgressBar can also contain text which can be set by calling Gtk.ProgressBar.set_text() and Gtk.ProgressBar.set_show_text().